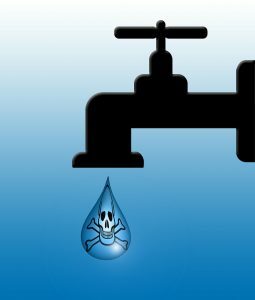 Consuming contaminated water can have very dire consequences to our health. Diarrhea, cholera, guinea worm disease, typhoid, and dysentery are just a few of the most common waterborne diseases, and are especially rampant in remote areas where water purification systems aren't as customary. More than 3.4 million people die every year due to pathogens and bacteria found in impure water (World Health Organization). In this article, we'll cover how to purify water for drinking with 8 effective and proven methods. The search for clean water is a human endeavor as old as thirst itself. Early river civilizations had the luxury of using surface water as their primary source of potability. But as civilizations industrialize and as water contamination becomes a reality, the search for efficient purification systems become a integral part of a growing society. As science and technology continue to improve, more efficient systems in purifying water are invented, established, and standardized. In the United States, laws are passed to ensure that businesses and corporations who manufacture and distribute water adhere to strict purification standards. Local municipalities are also held to strict standards in order to ensure that communities are given clean water consistently. So what exactly are the most efficient ways of purifying water? Which systems have stood the test of time? Which systems are cutting edge? We've researched the 8 best water purification methods with proven efficacy. While chlorine is often associated with swimming pools, when used in moderate amounts, it can make water potable by eliminating bacteria and viruses. Chlorine is widely used in purifying water at municipal levels, making water safe for drinking for a city’s population. 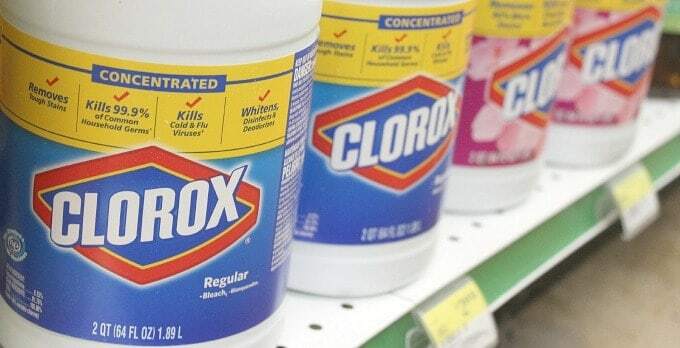 Bleach, the common term used for household grade Chlorine, is typically sold at 4% to 6% chlorine concentration and is what you’d use to disinfect water for safe drinking. The active ingredient in any Chlorine product is Sodium Hypochlorite; how it’s used is dependent on its concentration. When using household bleach, use 2 drops for every liter of water or 8 drops for every gallon of water. Let it stand for 30 minutes before drinking. This amount of time allows the chlorine to work (Scientific American, 1998). 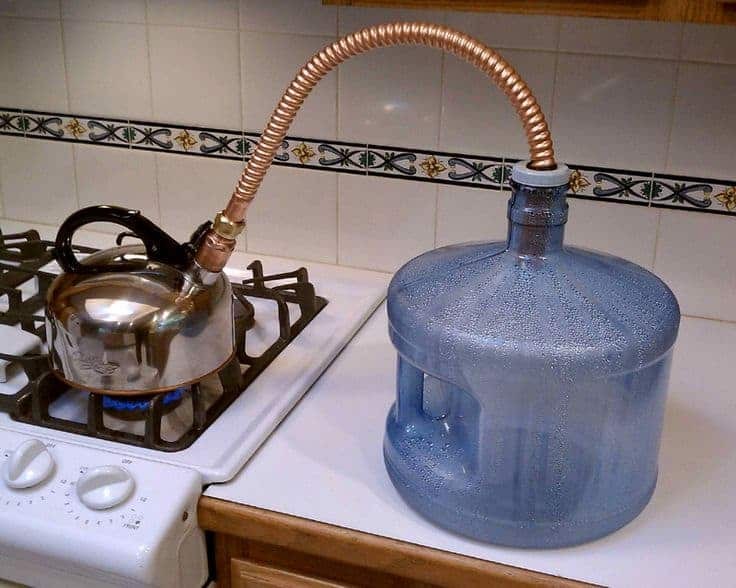 Treating water this way is great if you get your water from a tap that is sourced directly from the earth, or if you are out camping and run out of bottled water and are force to gather water from a natural source. Be sure to always use unscented bleach. Chlorine is effective against bacteria and most viruses. Norovirus, an intestinal disease that causes diarrhea, is particularly resistant to chlorine and will require the water to sit twice as long instead of the standard 30 minutes before consumption. Giardia, a parasite with a protective coating, will survive in chlorine treated water for 45 minutes before its safe to drink. Chlorine can also come in the form of pre-dosed tablets which would be dropped into a container of water and allowed to sit for 30 to 45 minutes while the chemical begins to destroy the pathogens. Water purification tablets are very convenient for those who are traveling overseas or hiking in the wilderness. The convenience of not having to measure the amount of liquid chlorine and being able to carry the lightweight tablets in a backpack have allowed these tablets to gain much popularity among campers, backpackers, humanitarians, and those traveling to areas where clean water is questionable. Read our article on water purification tablets for a detailed guide on how they work and which brands to use. Water filtration is probably the most common method of purification for personal consumption, mainly because of its versatility and ease of use. Water filtration systems come in many forms and sizes, some of which are even portable. The most common water filtration systems are integrated with household sinks and refrigerators by connecting to the waterline. The pore size of the filter, usually measured in microns, will determine what will be filtered through. While a standard micron size of 0.2 is small enough to block heavy metals such as lead and copper and large parasites such as Cryptosporidium, it will not block viruses. The National Sanitation Foundation sets a standard for effective water filtration products so look for an NSF stamp when selecting a filter to purchase. Filtration systems use activated carbon and charcoal arranged in a cylindrical or round block. These highly porous materials easily adsorb contaminants from the water. As water flows through the carbon, chemicals and contaminants stick to the carbon, allowing pure water to flow to the filtration system’s basin. Active carbon is highly effective in removing 81 chemicals from water. Studies show that it is also able to remove at least 14 types of pesticides and 12 types of herbicides from water. In addition, carbon also removes bad odor coming from chlorine-treated water (Tapp Water, 2018). The inner filter will need to be replaced periodically. Depending on the size and usage, most home filtration systems recommend replacing the filter every 6 months. Smaller, portable water filters need to be replaced more frequently. 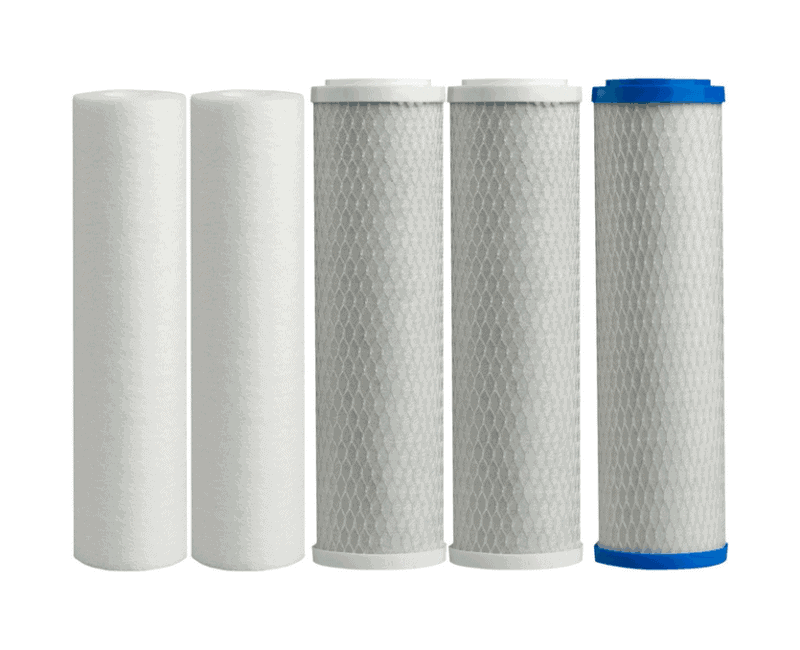 Filtration continues to be one of the most popular water purification systems because of its portability, affordability, durability, and ease of use. Water filters can come in smaller, portable forms which are convenient for travel and outdoor activities. Those who go hiking and backpacking often come across bodies of fresh water such lakes and rivers. While lakes and rivers are considered fresh in comparison to the seawater, they still need to be filtered before drinking due to the presence of sediment and potential bacteria. Having a portable water filter handy will eliminate the worry of ingesting harmful contaminants such as bacteria, parasites, sedimentary rock. Read our article on portable water filters for a detailed guide on how they work and which brands to use. The ultraviolet rays of the sun can be extremely destructive to microorganisms. We as humans avoid it as much as possible as it can cause skin cancer and other diseases. But we have learned to harness its power and use it to our advantage, especially in decontaminating our water from harmful bacteria and pathogens. 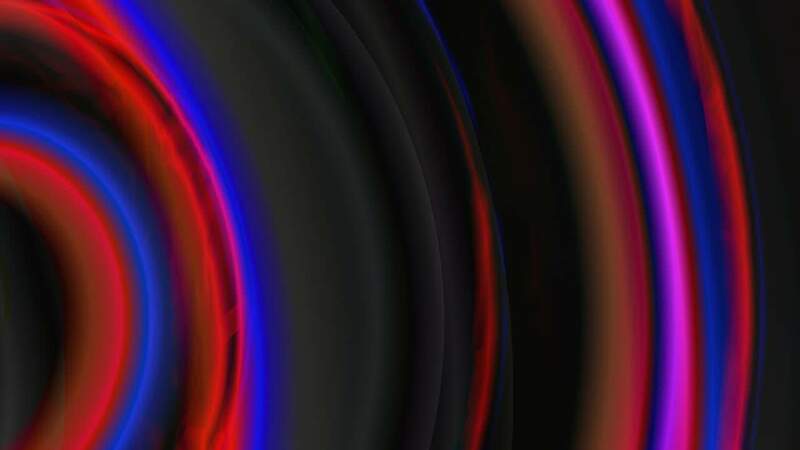 UV light has been a standard in the disinfection of water supplies at the municipal level for decades but has recently become available for home use. 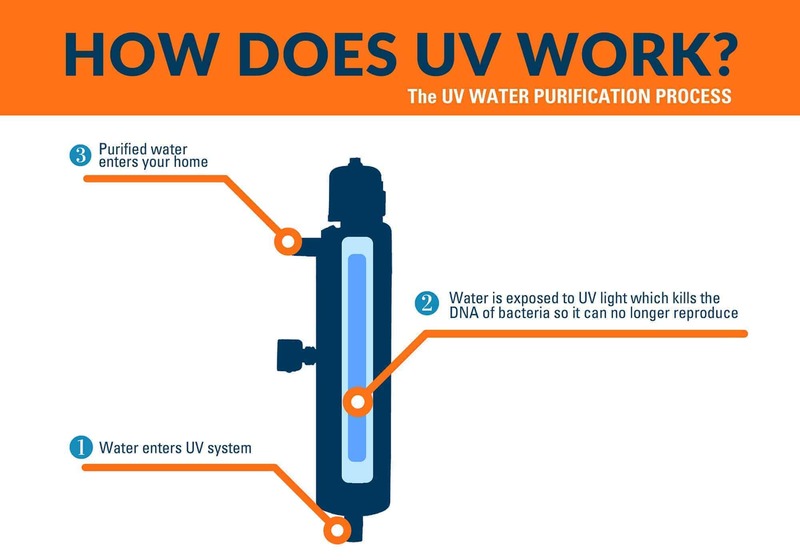 UV water purification is one of the most effective ways in eliminating pathogens from a water source due to the wider range of contaminants that are defenseless against ultraviolet radiation. Bacteria, waterborne viruses, molds, and parasites are all doomed under the ultraviolet light. UV water purification systems produce more UV light than that of the sun and are therefore more powerful than solar purification. In fact, a UV purification system is more effective at killing viruses such as Norovirus and Hepatitis than chlorine disinfection, and will kill them instantly as opposed to 60 minutes. The intensity, or frequency, of the UV light will determine its efficiency in killing organisms. The higher the intensity, the more effective at eliminating pathogens. The UV light is mounted in a chamber, water then flows through this chamber and any harmful bacteria or virus will die instantly as soon as it is exposed to the UV radiation channel. UV water purifications systems are so effective that they are guaranteed to kill 99.99% of microorganisms (Water Purifier). The ultraviolet light does not affect the water itself in any way; no strange tastes or odors will be detected. Despite its efficiency in killing microorganisms, UV radiation will not remove heavy metals and particles. Something else to consider is the high maintenance requirement for a UV purification system. 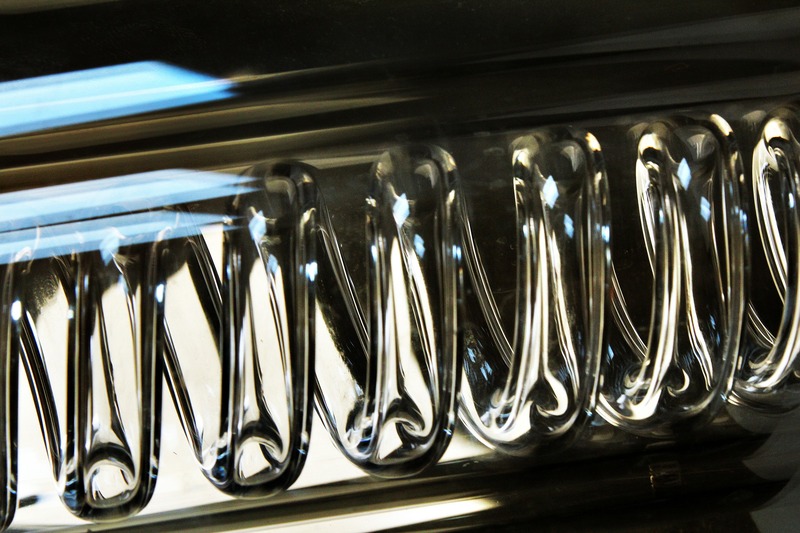 Frequent cleaning and proper part replacement are necessary requirements in maintaining a properly functioning system. Read our article on UV water purification systems for home use to find out more. Reverse osmosis is a process that forces water through a semi-permeable membrane to remove contaminants. 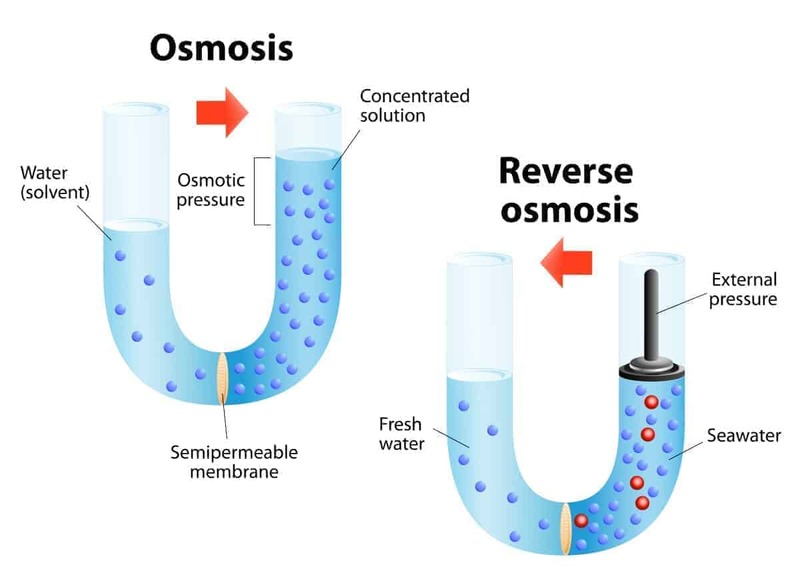 Osmosis, is a naturally occurring process where a less concentrated solution, such as freshwater, has a tendency to move toward a more concentrated solution, such as seawater. In this case, the difference in the two levels of concentration would be the saltwater molecules in the seawater. With external pressure, the process can be reversed, allowing the more concentrated solution to move toward the less concentrated solution. With a semi-permeable membrane in place, a screen which only allows smaller molecules to pass, the salt water molecules are left behind while the freshwater passes through. Thus, the result is pure, clean water, free of any contaminants (Pure Tec). Because the the semi-permeable membrane filters particles at the molecular level, reverse osmosis is extremely effective at removing bacteria, viruses, parasite cysts such as Giardia and Cryptosporidium, heavy metals such as lead and mercury, hard water minerals such as calcium and magnesium, and even fluoride and arsenic. It will not, however, remove certain pesticides and solvents small enough to pass through the membrane. RO systems have been one of the standard water purification systems for the bottled water industry and in military practices. Smaller, home RO systems are available for installation into the waterline allowing for clean, purified water to be accessed through the faucet and shower. RO systems can be quite expensive and requires frequent maintenance but is one of the most effective purification systems that can be accessed today. While reverse osmosis systems are widely used for industrial and commercial purposes, smaller home units can be purchased and installed under the kitchen sink and dispensed through the faucet. Home RO units typically run on a 3-stage system which includes a carbon filter, RO membrane, and re-mineralizing filter for taste. Some systems can include 5, 7, or even 10 stages. While the additional stages offer extra benefits such as pH level balance and UV filtration, a simple 3-stage system has everything required to produce pure, drinkable water. RO systems require frequent maintenance and replacement of filters in order to keep it functioning properly. Read our article on reverse osmosis systems for home use for a detailed guide on how they work and which brands to use. Iodine is more popularly known as a powerful disinfectant and salt component that helps prevent thyroid problems, but it is also used in water purification processes. Iodine, a reddish-orange chemical, kills bacteria and viruses at the cellular level and is available in many forms: tablet, crystal, liquid, or tincture. It can kill Giardia cycts when allowed to sit for at least 50 minutes instead of the standard 30 minutes, but is ineffective against Cryptosporidium. Iodine is very powerful. It can be lethal in high doses and should therefore be used to purify water only when other methods are unavailable, but not as a regular water purification method. Pregnant women, children, and those with thyroid problems or iodine allergies should avoid using it. To purify water with tincture iodine, combine two drops of iodine for every quart of clear water. If the water is cloudy, use 10 drops for every quart. Let the solution stand for at least 30 minutes and let the iodine do its job. Be informed that this will change the water’s flavor. If you are using crystal or tablet iodine, follow the manufacturer’s instructions. Typically, a bottle of crystal iodine can treat up to 2000 quarts of water (Instructables, 2008). Iodine is sensitive to light and should always be stored in a dark bottle. Like Chlorine, Iodine can come in the form of tablets which allow for convenience and ease of carry. Read our article on water purification tablets to find out more. Solar purification is an effective process when traditional purification methods are unavailable, such as when backpacking, living off-grid, or in emergency situations. The ultraviolet rays of the sun are effective in killing bacteria and viruses. A popular misconception about the safety of stagnant pond water is that the sun's heat kills any potentially dangerous microbes in the water. The reality is that stagnant ponds should always be considered unsafe because the water below the surface is an ideal breeding ground for bacteria and mosquitoes. One way to disinfect water through solar purification is through the use of plastic bottles and sunlight. Remove all labels and paper from the bottles and ensure they have no scratches. Fill them with water to about three quarters full, shake for a half-minute to activate the oxygen, fill with water to the brim, cover, and then lay it horizontally and expose to direct sunlight (Water Benefits Health). For best results, choose a location where direct sun light will be undisturbed for at least six hours. If it is a little cloudy, exposure time increases to two days. A Solar Still is a device that can be constructed in order to distill contaminated water into drinking water, or to pull condensation from damp resources in order to produce enough water for consumption. Solar stills can be a life-saving device if stranded in the desert without water or if lost at sea. This simple device uses the sun to evaporate contaminated water from a collection basin and collect the condensation in another basin. The condensation is essentially distilled and drinkable. It can be done with saltwater and can even be constructed to pull moisture from the ground if water isn't available at all. Solar stills can either be constructed out of simple materials or purchased and used for emergency. To learn how to make a solar still in a survival situation or to purchase one in case of emergency, read out detailed article about solar stills here. This is perhaps the most ancient method of purifying water and is still widely used, not just in remote places but also in highly urbanized areas. Boiling water produces enough heat to kill just about every type of pathogen, making water safer to drink. Applying the laws of pasteurization, a process used to make milk safe to drink, we know that most pathogens will not survive in temperatures above 70 degrees centigrade, provided that the water is boiled long enough (EPA, 2017). If the water is cloudy, first filter the large contaminants through a clean cloth or coffee filter. Heat the water and bring it to a boil. Thermometers might not always be readily available, so bubbles are a visual indicator that the water has reached 100 degrees. Let it boil for 1 minute straight. At elevations above 5,000 feet, boil the water for 3 straight minutes. After boiling, let it cool and put the water in a clean container and cover it so as to avoid recontamination of bacteria and microbes. Boiled water will always have a flat taste. Swishing the water around before drinking or transferring it from one container to another can improve the taste. Distillation is the process of collecting the condensation from evaporated steam and is the most effective way of ensuring that the water will be free of all contaminants. The process of distilling seawater into drinking water has been used by the Ancient Greeks since about 200 AD (Wikipedia). Many cultures throughout history have used distillation as an effective method of ensuring potable water. Although the materials used in the distillation process have changed over time, the science has remained the same, proving that distillation is a purification method that has stood the test of time. 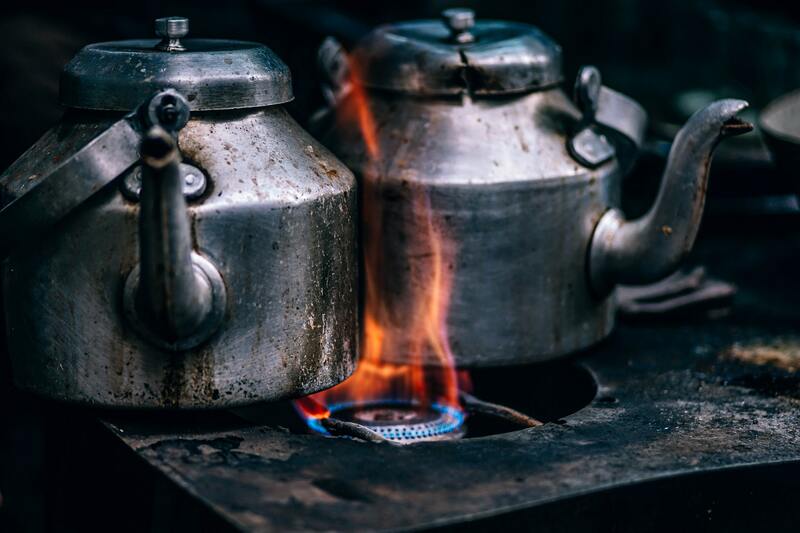 The materials needed to distill water are: a boiling pot, a container to collect the condensation, a tube to allow the vapor to travel through, and a heat source. Once the water begins to boil, the evaporation travels through the tube and collects in the new container. Because contaminants cannot exists in steam form, the "new" water is free of bacteria, viruses, parasites, particles, solvents, and chemicals. Because distillation is such an efficient process, it rids the water of essential minerals as well as contaminants. These natural minerals such can be supplemented simply by adding them or by ensuring a mineral rich diet. Home distillation units which sit on the countertop are available for purchase. Typically made of 304 grade stainless-steel, most distillation units can distill water at a rate of 4 gallons per day. Read our article on home distillation units for a detailed understanding of how they work and which brands to use. While the methods we've mentioned are certainly the most common and have proven effectiveness, research is being put into other methods that are quickly gaining traction in both private and government sectors. Electrodialysis Reversal (EDR) - In EDR, an electric current moves dissolved particles through a series of ionic membranes. This movement of particles gradually frees the water of contaminants. Nanofiltration - Nanofiltration is a membrane filtration process that filters water on the ionic level and is typically used for freshwater or brackish water sources. Flocculation - Flocculation is the process where colloids – mixtures of insoluble particles – come out of suspension in the form of flakes. The flakes, or floc, are removed, thus purifying the water. 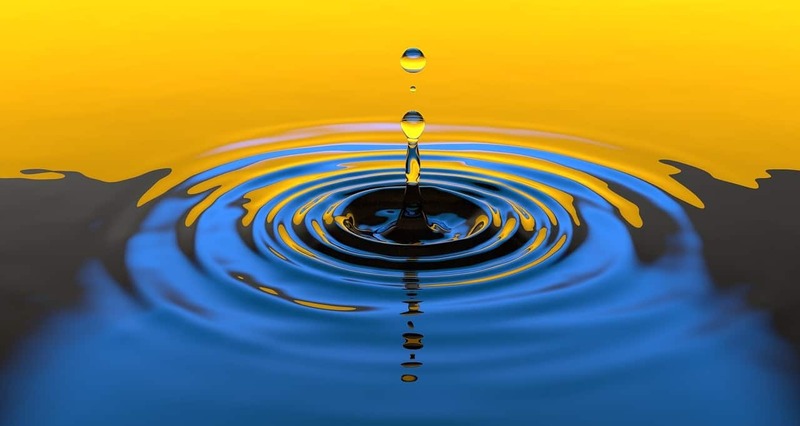 Bioredmediation - Bioredmediation is the careful process of adjusting the conditions of the environment to promote the growth of beneficial microorganisms – which ultimately reduce the population of the harmful pathogens in the water. What Exactly are We Purifying the Water From? The EPA states that there are four main types of contaminants to be found in water. The Safe Drinking Water Act (SDWA), a federal law that protects public drinking water supplies, defines "contaminant" as anything other than water molecules. We can reasonably expect most drinking water to contain some level of contaminant, especially since minerals such as calcium and magnesium fall into that category. The question is, which of these contaminants are harmful and how much of it is entering my system? Physical Contaminants - These are primarily sediment from rock or soil and are generally harmless on a biological level. However, too many large particles can be damaging to the physiology of the body. Chemical Contaminants - These can be natural or man-made compounds or elements that include: bleach, nitrogen, pesticides, toxins, lead and mercury, pharmaceutical drugs, or industrial bi-products. Biological Contaminants - These are microorganisms that thrive in water and can include bacteria, viruses, and protozoa. Radiological Contaminants - These are atomically unstable chemical elements that emit harmful radiation and can include: cesium, plutonium, and uranium. Water is the source of life. Three days without it can cause dehydration. But with the numerous dangers that may lurk inside it, and not to mention, are invisible to the naked eye, proper precautions cannot be overlooked. With the 8 different methods we've reviewed, all have their own strengths and weaknesses. Some have stood the test of time and some are revolutionary advances in technology. The best approach would be to utilize multiple methods, ensuring that you and your family are guaranteed the cleanest water possible. Thank you for taking the time to read our article on how to purify water for drinking. We'd love to hear your feedback in the comments section below. If you've found this article to be useful and are interested in learning more, be sure to sign up for our newsletter. water is precious. Use it wisely to stop it becoming a scarce commodity. Very Nice and informative post sharing insight into different water purification methods .